A new day is here. Tuesday. 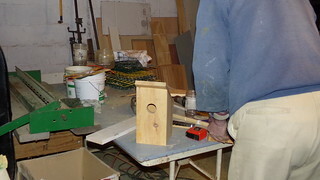 And a new home has been built – for our feathered friends out in the garden. I took this photo before Paul was finished, but he’s done now and has hung it up in the cherry tree out front (see bottom of page for photos). I need to go get a photo of it there, but it may have to be moved. I hadn’t specified where it should go to him. I am worried about squirrels getting into it in the tree. We’ll see. For now, a good deed has been done by my Paul and I am eternally grateful for this. The birds have started to make nests for their eggs/babies, mainly underneath the air-conditioner in the living room, and they are looking for something a little more cosy than our windowsill! We are simple folk here and won’t go in for fancy decorations on the birdhouse… I think the birds (whichever lucky one gets it) will love it just the same without paint etc. 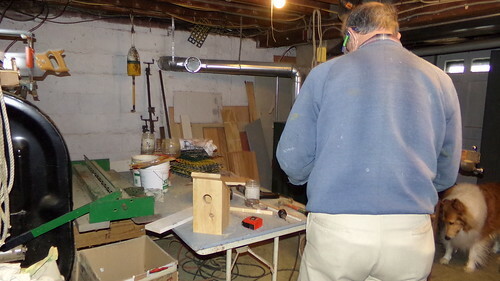 In a perfect world, I’d love it if Paul just kept on going and built more birdhouses – like 7 or 8 of them for all over the gardens. But he says he’s done. Just the one! I am no ornithologist but from what I’ve observed half-heartedly over the 27+ years we have lived here, it seems the birds all start to look for accommodation around this time of the year. They work like mad, too, to find straw and bits of twigs and dog furs (oh, lovely dog furs!) to make and line the nest with, then they have to get pregnant (which may be what those two finches are doing right now in the birdhouse!) and start the egg growing which may already be in process now… and finally they have to nestle down in the nest and lay that sucker. Or two suckers or whatever. By this time it’s coming on spring and then weeks go by while the eggs are waiting to hatch and then the birds break thru and then they have to grow up enough to fledge… and that all takes time! Your last comment is so funny. 🙂 I must admit to being quite the simpleton regarding birds and bird housing. I would’ve assumed by this time of year – especially in the middle of a harsh winter, that birds would’ve already had a home. Is it a matter of upgrading? 🙂 Very interesting. Oh my… I might have to put a red light over the little round hole/door! Those lucky birds! They must be filled with gratitude! Paul found this photo of him in a frame in the basement yesterday when he was cleaning out stuff and he wanted to throw it out. It’s a photo I’d had enlarged way back before digital cameras… I took it down at The Fort in Marblehead when he came in with a big lobster… and yes, I agree, he’s a hunk in so many ways. 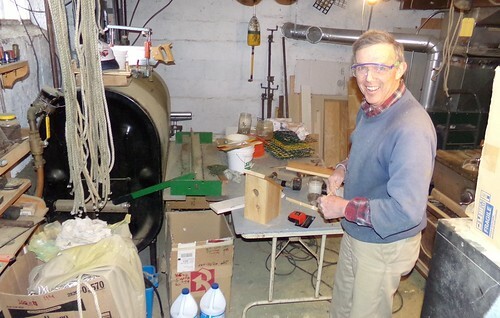 Now that’s positive thinking – building a birdhouse in February! But it’s also good planning, (BTW, Paul is a hunk!) As I type, we’ve just ended 2 days of glorious spring-like weather. It’s so invigorating until the blast of winter returns. I believe we’ll have snow before the end of the week – you, too? 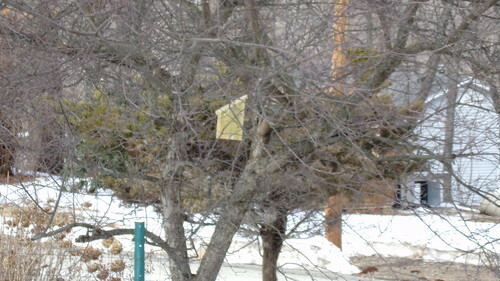 He did do a nice looking job on the bird house. I see he had a shop dog in there to supervise! 🙂 It will be neat to see what bird gets it. You have birds that are nesting? You have birds???? One day last week it got warm enough that I heard a chickadee. Other than a few crows, I haven’t seen another bird anywhere around here. And they sure aren’t nesting. Tonight we’ve got blizzard-like conditions with white-outs and blowing snow. The temp is currently 13F with a windchill of -6F. 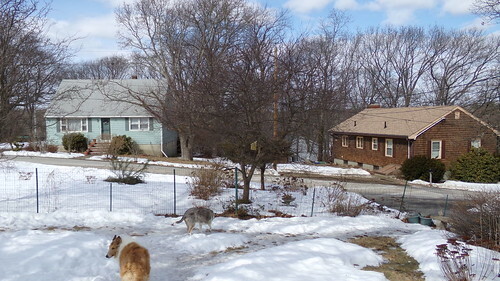 We need spring badly. It’s been one very long and cold winter, here. He did such a prefect job on the one house…I think he should make more and hang them here and there. Way to go Paul! I have bird feeders and it seems birds won’t nest in my houses, probably due to ‘traffic’. Birds just don’t care much for painted houses..they say that paint smell bothers them and some times they move on …I don’t know it for a fact…just heard of it. Neat. And yes, I am sure the birds don’t care about whether the house is fancy or not. Having said that, when I was a kid there were still in the trees a few of the bird houses my grandfather once built and these things had white painted siding and shingled roofs! Maggie, yes spring is on its way… the birds have been driving me nuts building a nest under the AC unit in the living room window… I am afraid they will break thru and come flying into the house one day – of course when Paul is out. Have you ever tried to shoo a bird out of a house? There is nothing so melodious as birdsong I think! Even here, in the frozen landscape, there are birds calling to one another. Spring is on the road, travelling north!